KEPCO, apart from its exisiting operating coal power plants, is planning to extend its coal power generation capacity. This is completely at odds with the Paris Agreement climate goal which calls for a maximum on global temperature rises to below 1.5C. KEPCO (Korea Electric Power Corporation), founded in 1898, is the largest electric utility in South Korea, responsible for 93% of South Korea's electricity generation. Together with its affiliates and subsidiaries, KEPCO has an installed capacity of 65,383 MW, including coal power plants, nuclear power plants and hydroelectric plants. KEPCO owns or co-owns several power generating (including coal) operations overseas, including in Mexico, the Philippines, Saudi Arabia and Jordan. It is planning to expand its operations in South Korea, Botswana, China, Japan, Vietnam, Swaziland, South Africa and Russia. KEPCO has 27.327 MW of installed coal power capacity which equals to 39% of its total power production. It is part of a group of 31 companies which are responsible for half the world's installed coal power capacity of 983,000MW. As of December 2017 the Korean government holds 18.2% of KEPCO shares and the Korea Development Bank holds 32.9%. KEPCO's shareholder structure can be viewed here. In general air emissions from coal-fired power plants cause serious human health impacts. Coal-fired power plants emit 84 of the 187 hazardous air pollutants identified by the U.S. Environmental Protection Agency. Several of these pollutants cause cancer, according to the National Toxicology Program. Hazardous air pollutants released by coal-fired power plants can cause a wide range of health effects, including heart and lung diseases. Exposure to these pollutants can damage the brain, eyes, skin, and breathing passages. It can affect the kidneys, lungs, and nervous and respiratory systems. Exposure can also affect learning, memory, and behavior. Greenpeace reported on health issues attributed to coal use In the Philippines (one of the countries in which KEPCO is active) and concluded that existing coal power plants and projected coal capacity are estimated to be responsible for 960 premature deaths each year due to stroke, ischemic heart disease and other cardiovascular and respiratory diseases. Fly ash and bottom ash, which are residues created when coal is burned at power plants. 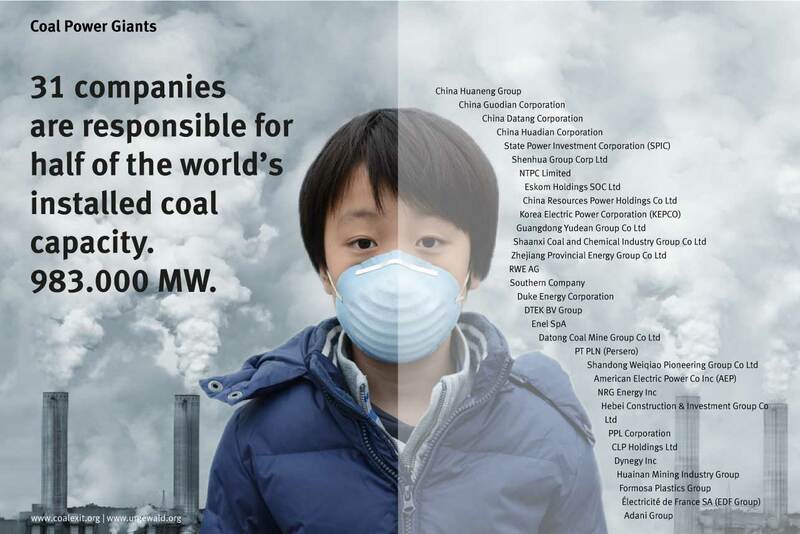 Considering KEPCO's 27.327 of installed coal power capacity and the effects of emiting CO2 into the earth's atmosphere these power plants have, KEPCO is responsible for having major adverse impacts on the environment and climate change. KEPCO'S major shareholder is the Korea Development Bank which holds 32.9% of KEPCO's shares. Between 2014 and 2017 38 financial institutions have provided a total of USD 11.344 billion in loans and a total of USD 11.626 billion in underwriting services. Below are listed the banks and other FIs involved. There are no projects active for Korea Electric Power Corporation (KEPCO) now.